Used Oil Management | D&B Engineers and Architects, P.C. A broad range of federal, state, and local regulations impact the management, recycling and reprocessing of used oil. D&B’s consulting services include compliance, recordkeeping and reporting, as well as design and permitting efforts regarding used oil management at various facility types. 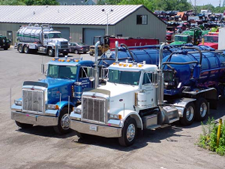 In addition to providing extensive consulting services to small, mid-sized and major generators throughout the tri-state region, D&B provides comprehensive environmental engineering and compliance services to large commercial used oil management facilities throughout the northeast.